A panel met at Brookhaven National Laboratory to chart the course for US investment in particle physics experiments. Nature guards its secrets closely, and there may be more than one way to pry them free through experiments at the frontiers of particle physics. In the high-energy world of massive colliders and ultra-rare particles, scientists track exotic and never-before-seen phenomena to unravel some of the greatest mysteries in the cosmos, from dark energy to the imbalance between matter and antimatter. This week, more than 200 physicists gathered at Brookhaven National Laboratory in New York to focus on future accelerator-based experiments during the third meeting of the Particle Physics Project Prioritization Panel, or P5. The panel, composed of 25 leading scientists from around the world, is charged with recommending what new scientific endeavors should be prioritized and executed by the United States under three budget scenarios over the next decade, in the context of a 20-year global vision for the field. 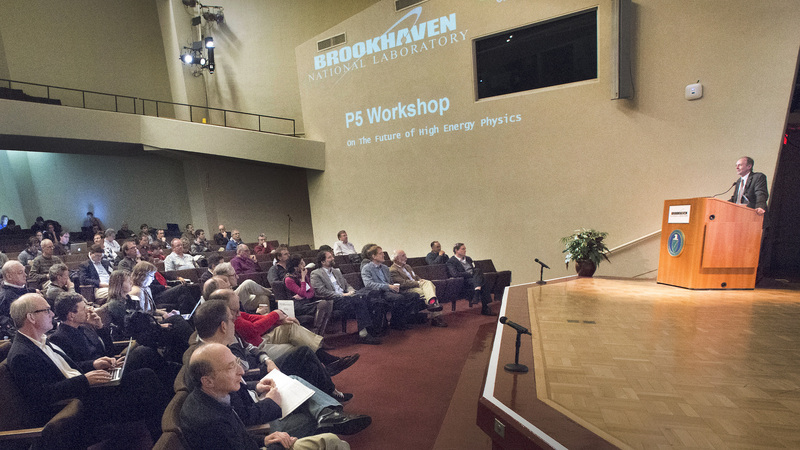 More than 200 physicists gathered at Brookhaven National Laboratory in New York this week to focus on future accelerator-based experiments during the third P5 meeting. Over the course of three days, physicists presented detailed studies on pressing scientific puzzles and the tools and tactics best suited to address them. Under the direction of the US Department of Energy and National Science Foundation’s High Energy Physics Advisory Panel, P5 will now evaluate the proposals and issue recommendations in the spring. Some scientists championed further studies of the Higgs boson, the mass-endowing particle whose discovery validated theories posited almost 50 years ago and led to the 2013 Nobel Prize in Physics. Kyle Cranmer, a physicist from New York University, noted during the P5 town hall meeting that only half of the Higgs boson’s production and decay processes have been observed, meaning considerable surprises—including hints of unification theories such as supersymmetry—may be uncovered by future collider experiments. The Higgs boson only helps explain a small sliver of the mass of the cosmos, and some proposed experiments might help flesh out that 5 percent. The other 95 percent remains shrouded in what physicist Charles Baltay of Yale University called “the dark side of the universe” during the P5 meeting. The composition of dark matter, known only from its gravitational footprint as a kind of galactic glue, is completely unknown. Future collider experiments discussed at the meeting may be able to directly produce a dark matter particle and offer unprecedented insight into 23 percent of the cosmos. Dark energy, which makes up 72 percent of the universe and drives its accelerating expansion, is perhaps even more poorly understood. Experiments under consideration by the panel would survey the cosmos, making extremely detailed measurements to test the dark energy-dark matter paradigm, with further surprises expected. Many physicists, including Sarah Demers of Yale University, called for investment in building experiments that expand the field for young scientists. New and upgraded instruments not only advance research, but the design, construction and operation of innovative technology can offer singular training and help create career opportunities. The two previous P5 meetings at Fermilab in November and SLAC National Accelerator Laboratory earlier in December focused on the international context, neutrino physics and the cosmic frontier. All three sessions built on the past summer’s final Snowmass meeting, which was the culmination of a year of workshops and input from the community on the future of particle physics. On March 1, 2014, P5 will issue a preliminary report on recommended experimental priorities, with the final report to follow on May 1.